This page was created as a place to host content and commentary on Darpa's MIMIC program which ran from 1987 to 1995. Some of the downloadable content below was submitted by Nabil, thanks! Mentioning the Darpa MIMIC program brings tears to some old engineers’ eyes. In some cases, the tears would be because of all of the money that was wasted on non-starters like AlSiC housings, non-contact RF probing and the "MIMIC Hardware Description Language." But without this huge government program, smart phones would be ten years in the future. The first MIMIC awards went to 26 companies on four teams, totaling $225M. In all, $570M was spent. In today's dollars that would exceed $1B. Eliot Cohen, "The MIMIC Program - A Retrospective", Microwave Magazine, June 2012, pp. 77-88. That article is available if you subscribe to IEEE Explore, or if you were a paid member of MTT-S in 2012 you might have saved a paper copy. Here at Microwaves101, we'll give you the free version of what happened, hopefully with some class participation. Please email us comments on this program, particularly if you worked on it; we'll post your inputs on this page. The MIMIC program was introduced at the 1986 IEEE MTT-S International Microwave Symposium, which was held in Baltimore. Those of us that went there, another memory was that the books of papers that were handed out had the Pride of Baltimore on their covers. If you walked down to the harbor to see this full-sized clipper-ship replica, you would have seen an empty slip. The Pride of Baltimore sank on May 16, 1986 and four people died. Of course, this has literally nothing to do with the MIMIC program but it was the other Big News at IMS that year. Sixteen teams involving 48 companies, or virtually the entire U.S. microwave community! There were four teams in Phase 1. Phase 2 was where the majority of the money was spent. Below are the competing teams. Actually, after Phase 1 there was no real competing, just everyone trying to make the metrics they signed up for. 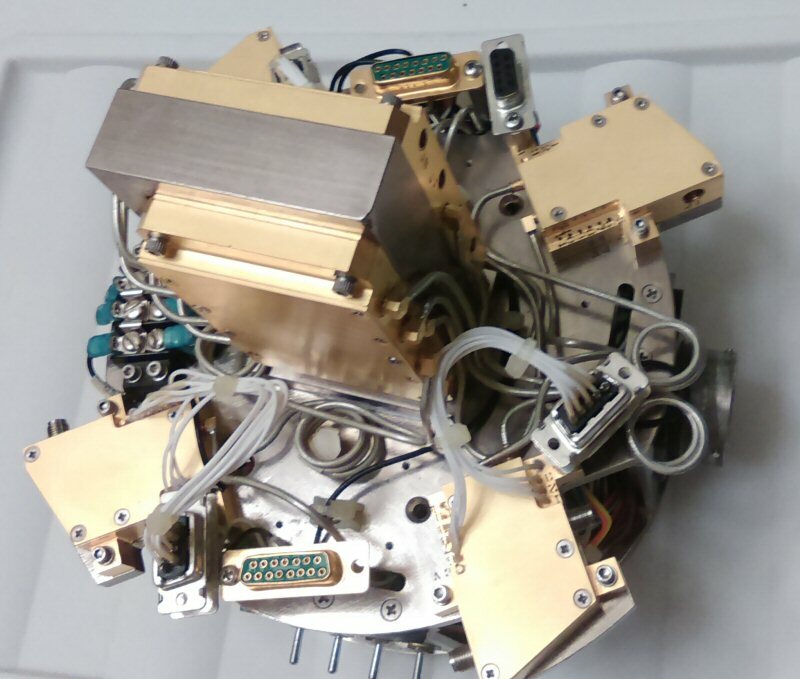 One of the MIMIC Phase II demonstrators was a Ka-band seeker test bed. It had Ka-band LNAs, mixers, LO amplifiers, IF amplifiers all of which were developed under the MIMIC program by Raytheon, in Andover and Tewksbury MA. Below is a photo of this demo, there are four Ka-band quadrant modules around the perimeter and a pair of C-band(?) modules in the center. There is probably a mono-pulse network in the closest C-band module; it appears that phase matched semi-rigid cables are connecting it to the quadrant. None of the modules are hermetic, it is likely that they had to be reworked several times in order to make a working prototype. The Ka-band seeker test bed originally cost perhaps $200,000,000. It is looking for a permanent home, one recurring problem with big companies is that they tend to do periodic house cleaning and throw away tons of historic artifacts. Perhaps this unit will find its way to the National Electronics Museum in Linthecom Maryland, which was once Westinghouse's company museum. An ironic place for it considering how Raytheon and Westinghouse (now Northrop Grumman) have squabbled over the years.... if you google the two company names and "lawsuit" you will find more than 140,000 hits. It is interesting that some of the teammates merged into mega-companies years later, such as Westinghouse/TRW/Northrop (now Northrop Grumman) and Raytheon/TI (now Raytheon). Many of the companies are now just dead name plates that we try to keep track of on our where-are-they-now page. Below are some public domain documents you can download to learn more about the MIMIC program. You can find these and many more by searching on the keyword "mimic" on the defense information technical center web site. This is a great site to surf if you are bored at a meeting!